Developing technology for disabled people has become the Partnership's main area of specialisation since 1981. As a design consultancy, we have collaborated with manufacturing companies to launch new products in the marketplace to improve mobility for disabled people and enable more integrated lifestyles. 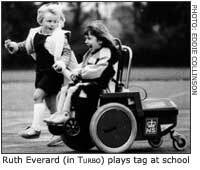 In 1981, Dan and Lou Everard's oldest child was diagnosed with a permanent disability, severely affecting her mobility. Dan was able to provide her with the high degree of mobility she needed from an early age. This has led to a lifetime committment to supporting disabled people and their families and sharing the family's experience in this field. Over more than thirty years we have acquired unique expertise in the field of personal powered mobility. During the last twenty years the Partnership has been running the Dragon project: designing, developing, testing and building a new line of powerchairs, which utilizes our unique experience and knowledge. In the process, we adhere to certain principles of good design in this field, which we seek to promote. In 2005 a new company was formed, Dragonmobility Ltd, as a spin-off from the Partnership. The company manufactures and supplies to the market powerchairs based on the designs of the Dragon project. For more information visit their website at: www.dragonmobility.com. To learn more of how this has all come about, click on history. Feel free to contact us if you have ideas about the kind of developments in powered mobility you would like to see, or could use our technical expertise in any projects you want to develop yourself.